"I was immediately gutted for Furyk. I really like the real ale swigging amenable major champion and Ryder Cup Captain who is the only man to shoot 58 on the PGA Tour and to have shot two sub-60s. He’s an absolute legend in my eyes and I’d have loved to have seen him cap off a magnificent career by becoming the Players Champion at the age of 48, almost four years after his last win." Golf doesn't get much better than the final round of the Players Championship yesterday. We began the day with Jon Rahm leading by a stroke over Rory McIlroy and Tommy Fleetwood, with Jason Day two back and alone in fourth. Given the leaderboard was dominated by four such elite players, it always looked likely that one of them would prevail but had Fleetwood not rolled in his eight-foot par save on the fourth hole yesterday, we'd have momentarily seen nine players tied for the lead! And that set the tone for a terrific finale. Paul Krishnamurty's brilliant [310.0] Find Me A 100 Winner tip, Jim Furyk, was matched at just [3.2] after this amazing approach to the final hole, just minutes after his birdie attempt on 17 had somehow failed to drop. It looked like Furyk's -15 total might just be enough for a playoff at least but having missed a par putt from five feet on 14, and having hit a drive that was a yard away from being dead in the rubbish right of the righthand side fairway bunker, Rory produced this superb approach and birdie putt on 15, just seconds before Jim tapped in his birdie putt on 18. Rory's play was immaculate after that and he went on to birdie 16 and to par 17 and 18 to win by one and poor Furyk was left to rue what might have been. 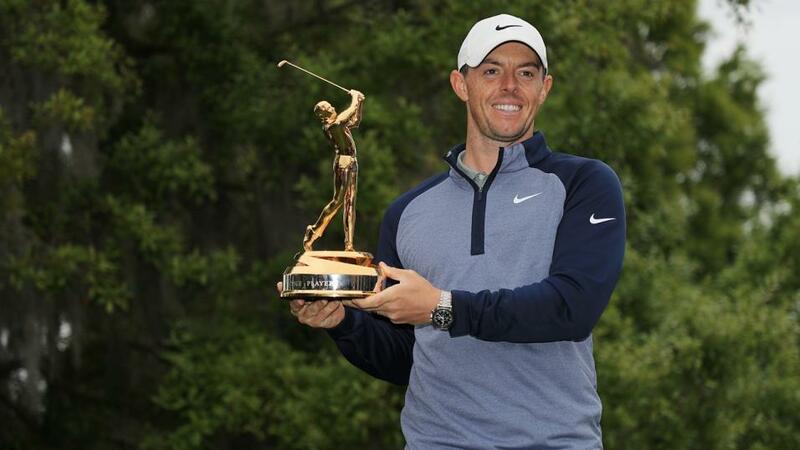 The 48-year-old had endured a very different experience to Rory at the fateful 15th. He'd missed a par putt from three feet! I was immediately gutted for Furyk. I do like the real ale swigging, amenable major champion and Ryder Cup Captain who is the only man to shoot 58 on the PGA Tour and to have shot two sub-60s. He's an absolute legend in my eyes and I'd have loved to have seen him cap off a magnificent career by becoming the Players Champion at the age of 48, almost four years after his last win. And him doing so with Paul picking him out so brilliantly at such a massive price would have been the icing on the cake but it wasn't to be. It reminded me of ten years ago when Stewart Cink denied Tom Watson one of the greatest sporting stories of all time. Sport can be very cruel at times. After such a brilliant tournament, it would be easy to forget what had gone before but I really enjoyed the first edition of the Kenya Open at the delightful Karen Country Club and we were treated to a fabulous finish there too. Just like we witnessed later on at Sawgrass, but on a slightly smaller scale, a number of players held a chance to take the title. Justin Harding, who was looking for back-to-back wins on the European Tour, traded at just [4.3], Gaganjeet Bhullar began round four fast and he hit a low of [2.76], as did Louis De Jager when he stood over a very make-able birdie putt on the 72nd hole to tie the lead, and young Spanish sensation, Adri Arnaus, a [30.0] chance before the off, was matched in-running at just [2.42] but his putter let him down badly when it mattered most. The 24-year-old needed as many as 30 putts on Sunday yet, just like Harding and De Jager, he was ultimately beaten by a solitary stroke. Guido Migliozzi came in to the event with form figures reading MC-MC-56-MC-MC-63-MC and he was matched at a high of [310.0] last Monday before going off at around [150.0] but the 22-year-old, who won the Italian Amateur Championship a remarkable six times in-a-row between 2011 and 2016 could be one to keep an eye on. He's won three times on the Alps Tour and he qualified for the European Tour via Q-School. Having bagged both winners in-running last week at nice prices, it was a case of close but not close enough this week. As highlighted in the In-Play Blog, I backed both Harding and De Jager at halfway in Kenya but both lost by a stroke and having played numerous longshots in play at Sawgrass, who nearly all traded much shorter than I backed them at, I drew a blank there too. I toyed with laying some of the De Jager bet back when he traded so short on 18 yesterday (too short my instinct told me) and I really should have layed some of my Furyk wager back too but didn't, so it was ultimately a disappointing week. I've no complaints though, I lost far more in Kenya than I did at the Players but even though he was beaten, I still think the 5/2 about De Jager at halfway was a very good price. He played some awful stuff on the front-nine on Saturday and still only lost by one and I'm pleased with how I kept my stakes down in Florida in what was a really hard event to predict in-running. The Players moving to March seemed to assist the big hitters. Rory, Day, Rahm and Dustin Johnson all figured and the softer conditions suited their aggressive long driving but Sawgrass is a superb venue and it says it all that Furyk could come so close to winning. It really is a great all-round test of skill and it was an absolute joy to watch the finish unfold, but once again we saw a couple of age-old trends come to fruition. I found the event a little frustrating as I know it suits the frontrunners but I didn't at any stage see any value in them - especially the winner - but we've now had 38 editions of the Players Championship at Sawgrass and five strokes is the furthest any winner has trailed by with a round to go and that's only happened twice. And 37 of the 38 winners have been tied for seventh or better through 54 holes. It was like some sort of pile-up early on yesterday with the leaders stalling and the field closing up but once again, the winner finished up being someone in the van throughout. It may be beneficial to up with the pace, but being in front with a round to go is not where you want to find yourself! This tweet highlights that perfectly. The Wyndham Championship angle in was given yet another huge boost with last year's winner, Brandt Snedeker, finishing fifth and the 2017 runner-up, Ollie Schniederjans - who has just switched to Butch Harmon and needs watching - put in his best effort since that second. He was a complete no-hoper before the off but he hit [12.0] before ultimately falling away to finish tied for 16th. Over at the Kenya Open, Greens In Regulation and Scrambling were the key stats and I just can't wait for next year's renewal. The course was reminiscent of Delhi and avoiding the trees was key but it was a little more open than that and there were a number of risk and reward holes that made it a brilliant venue. And one last observation, it's been suggested before that South African courses (and Karen was similar to a South African venue) are often comparable to a number of the tree-lined courses the top Italians play growing up. I don't think it's a coincidence that Francesco Molinari has a great record at Wentworth and it's interesting to note that his brother won here at Karen in 2007. Lorenzo Gagli won the Kenya Open at Muthaiga GC last year but that too is tree-lined and it might be worth checking out the Italian contingent again in 12 months time. The praise received in the aftermath and the many comments made on Twitter suggested the victory was mightily impressive and it was one that will inevitably lead to many more wins and possibly that much-coveted first Green Jacket to complete the Major Grand Slam, as soon as next month, and maybe it will, but I'm not convinced. Rory bogeyed his first two holes in round three when tied for the lead and he played his first four holes yesterday in two-over-par too. He failed to break 70 over the weekend and he was aided by the fact that his three main challengers all failed to break par yesterday. His five-foot birdie putt on the ninth turned the whole day around but one could argue that his third shot there was slightly clumsy and he'd played his first eight holes in two-over par. For much of the day, it looked like he'd blown yet another great chance to win. I know I'm being ultra-critical, and I know he finished well, but Rory gets beat far more often than he converts nowadays and he always trades shorter than he should do so. It's also worth noting how much the softer conditions helped his cause. I'm sure this will be construed by some as just a case of me not giving credit where it's deserved but it's worth going in to detail to try and assess how he'll fare if he does get in to the mix at Augusta, where he is currently the Betfair Exchange favourite. I fancy the market will side with him even stronger on the back of this victory and I'm not entirely convinced that should be the case. And finally, one debate that keeps rearing its head is whether he should stick with having his mate, Harry Diamond, on the bag. I've not got an opinion on it because I have no idea what makes Rory tick but Jon Rahm may as well get a buddy to carry his sticks, as he's not listening to the perfectly able and experienced Adam Hayes. Read this story for the full lowdown on Rahm's calamitous decision to go for the green on the par 5 11th. That's more than enough looking back when we've got plenty to look forward to. The European Tour is off to Malaysia for the Maybank Championship and the PGA Tour stays in Florida for one last week to take in yet another brilliant event - the Valspar Championship. I'll be back tomorrow with my previews.